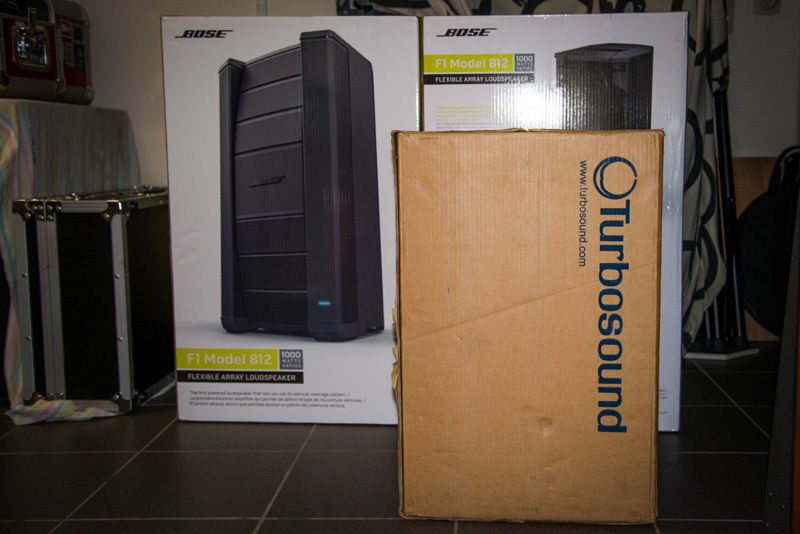 After, what seemed ages, yesterday 2 Bose F1 812 tops finally arrived. Since I hadn't got the time to give them a proper test run, I quickly popped them out of the giant cardboard boxes, to have a look at them. They are neat, finish is spot on and I really wanted to have a good look how Bose implemented the whole "flexible array system" with the moving panels. It feels sturdy and very solid, so again spot on. Put some juice in one of the units and connect my iPhone to drop a tune or two. Even with a pretty low output from an iPhone you get decent volumes without having to push the F1 to the max, the sound was full, but then again, I didn't have a reference. 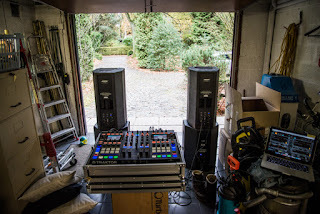 The unit was on the floor in my garage, changing the array from straight to reverse-J immediatly improved the sound impression from my standing position. 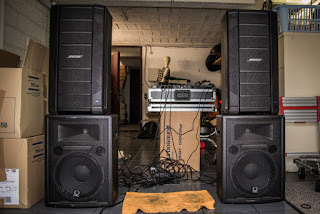 So for small events, putting these on the floor, without bass units or poles would do just fine in the reverse-J position, plus you get a very clean dj booth. 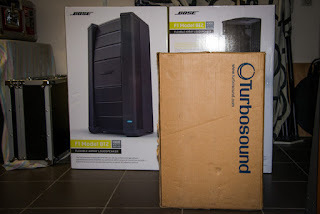 Today I put the F1s head-to-head with my current Turbosound TXP-121 tops. Both have a 12" woofer, both are around 20kg, both are located in the premium (price) segment and both come in solid cardboard boxes. After 5 years the TXP cardboard is still impeccable, but the Bose ones are HUGE, so I guess the Bose bags will be ordered sooner than later. The F1s are slightly higher and deeper than the Turbosounds, but they still fit properly in an estate in the upright position. TXP handles are cut-outs in the speaker, while the F1s are proper handles, the latter is easier to carry, especially when carrying 2 units. I'm not going to compare tech specs from both units, only going to compare the sound. The Turbosounds are the only speakers I got so much positive comments on, going from the massive sound pressure coming out of such a little unit to the very good and detailed sound. The only units I got similar comments on were the Bose L1 poles, but the investment on these cannot be spread over 2 or more years so I decided to go for the F1s and buy the bass-units later. 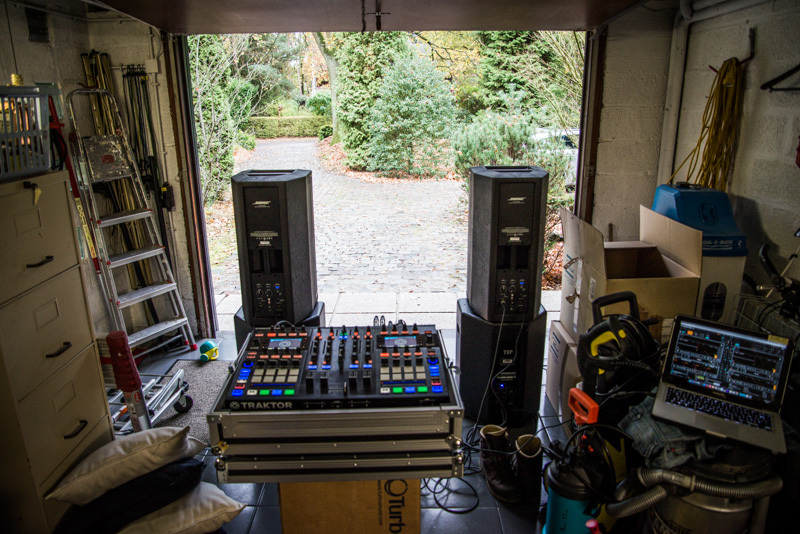 Hooked up my Traktor S8 to the 4 top speakers and launched some different songs onto the driveway. First Paul van Dyk - Let Go. Sound of the Bose F1s was very full, even when I was about 25-30 meters away from the speakers the whole sound spectrum was still present. Compared to the Turbosounds the bass was more pronounced and deeper, while the highs were a little less crisp. The Bose speakers could keep the full sound over a longer distance than the Turbosounds while the fall-off in volume was almost the same for both. Other bass driven techno tracks proved the bass on the bose F1 is deeper, without becoming muddy. Skinny Puppy - assimilate, one of my favourite all time tracks, this song is etched in my memory. The TXP-121 speakers sounded more crisp, snares and hi-hats have more bite than on the Bose F1s. This is similar to what I heard when switching back and forth between a classic 2-Way PA speaker and the Bose L1 system. The male choir intro of This Corrosion from Sisters Of Mercy enlarged this feeling. While Turbosound was very crisp during the purely vocal part, they became little aggressive when the drums kicked in. The Bose F1 on the other hand stayed well composed and filtered tha agressiveness out of the transition. I wanted to put more emphasis on the aggressive sound by pumping Amon Amarth - Pursuit of Vikings & Korn - Falling away from me through the speakers. Again the Bose F1s polished the biggest edges out of the TXP-121 sound, but stayed very lively and never felt overprocessed. Yes the Bose can pump some more SPL and yes the Bose has a wider dispersion but I cannot say it is outclassing the Turbosounds. 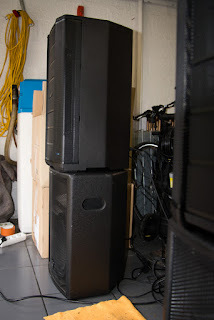 Both sound very good and both can be perfectly used as a full range PA speaker on small/medium events as long as you do not have to generate a tomorrowland rumbling bass. The differences in sound & feel are reinforced by going back and forth between the speakers while listening to specific parts of the productions. If you listen to a complete song on one pair and replay the same song on the other the difference becomes much smaller. That said I can see/hear why people give compliments on the Bose sound, the sound is more polished and feels very rich. 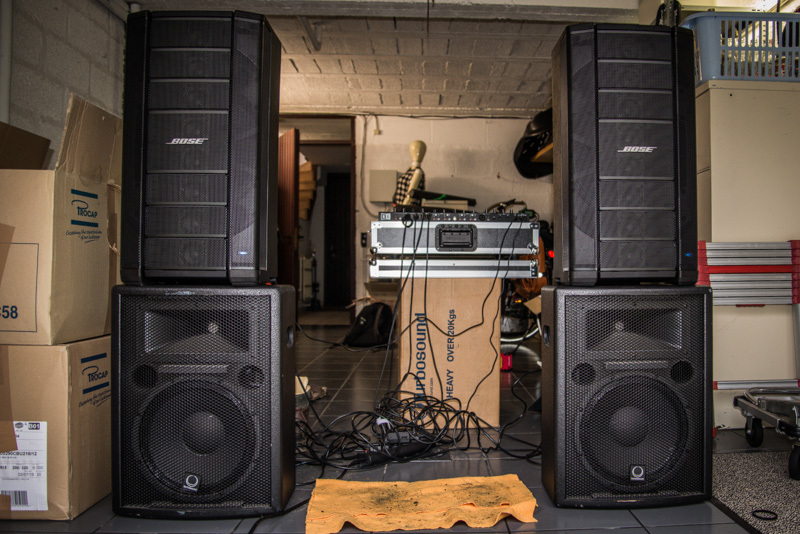 I cannot wait to pump some serious beats @ high SPL out of these babies on the next djLeBart allround dj gig.